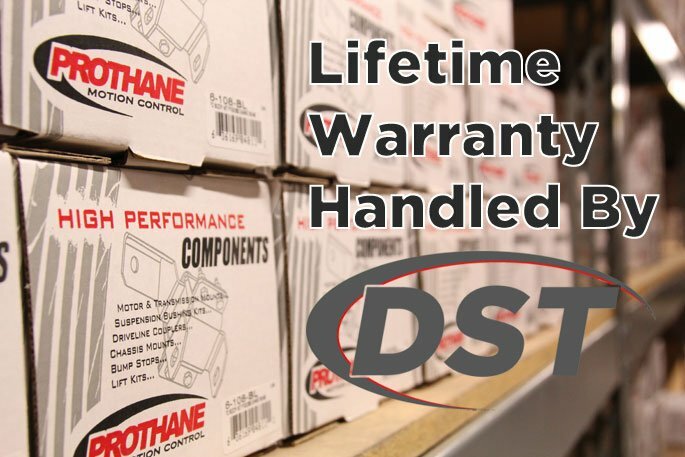 Prothane backs up their polyurethane bushings with a lifetime warranty, and while it's not likely that you will ever need to use it, DST will handle the process for you in house when you buy from us. If you're looking for a "Made in the USA" brand of suspension bushings that will strengthen the weak points in your original suspension and are covered by the manufacturer with a great warranty then look no further! Polyurethane Suspension Bushings are really durable and much more resistant to wear than the original rubber bushings that are installed on almost all vehicles from the factory. When you install poly bushings on your vehicle we're pretty confident that you will never have to replace them because of wear and tear.